How do you collaborate without leaving introverts behind? Last week, I watched The Power of Introverts, an excellent TED Talk by Susan Cain (she also has a book out on the same subject called Quiet: The Power of Introverts in a World That Can’t Stop Talking). In her talk, which has been viewed almost two million times since it was posted last month, Susan makes a compelling case that the open, collaborative world we embrace today is not always set up to harness the best work from introverts. As we’ve moved toward more open office plans, collaborative processes like design thinking, and into a digital world now dominated by the word “social,” Susan wonders who is looking out for the introverts? Should introverts feel guilty about wanting to do their thinking and working alone? And can introverts do great work in group settings? By emphasizing a collaborative, social process am I risking leaving introverts—and their best ideas—behind? It’s no secret that I am a life-long introvert myself. I am much more comfortable writing or reading a blog post in my living room and discussing it via comments or Twitter than I am sitting and talking about it with someone over coffee or, worse, at a social gathering like a party or a conference. So I get where Susan is coming from. Deeply. In her TED Talk, she at one point pleads, “Stop the madness for constant group work.” When she said this, it hit me pretty hard. The first thing that came to my mind was the one gazillion design thinking ideation sessions I’ve either run or participated in over the last 7 or 8 years. I’ve personally never had much trouble speaking up during ideation/brainstorming sessions. But I also suspect I am a relatively mild introvert compared to others I know. I started to wonder what the hard-core introverts were thinking during these sessions (and if you were one of them, feel free to tell me below in the comments). Did they feel like they were being talked over by extroverts? Did they feel like they were out of their element, or needed more time to process their thoughts before blurting them out and having them recorded on the wall? Would they have preferred to contemplate on their own instead of thinking socially as part of a group? Then another thought stuck me: I’ve met a lot of software engineers over the years, and while not all of them are introverts, many of them are. Frankly, I don’t think too many extreme extroverts could stand to sit in their office and stare at a computer screen all day. But for some introverted software developers, this is bliss. Yet open source software is developed in a collaborative, social process… run in many cases by introverts. For me at least, the answer comes down to the difference between virtual and in-person collaboration. Open source software developers do much of their collaborating online. Often this is because they are geographically dispersed around the world. But I’ve also seen developers sitting two feet away from each other communicating via instant messages or email. 1) It allows them to avoid stressful in-person social interactions. 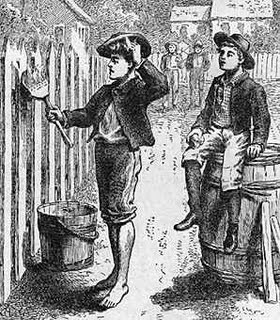 2) It allows them to take their time, contemplate, and think deeply before responding. Over the past two years at New Kind, I’ve personally been doing less and less in-person design thinking ideation sessions, instead hosting more open, collaborative sessions online. Sometimes they are efforts like the hackathons I’ve run for the Management Innovation Exchange that involve hundreds of people collaborating from all around the world. Other times they are client projects where the collaborating happens via Basecamp or another online tool. I’ve found I enjoy facilitating sessions online much more than in-person sessions, and I think it suits my personality better. Because the collaboration happens asynchronously, I can take my time crafting thoughtful responses and generating ideas. I can wait until I’m in the right frame of mind to participate, and most importantly, I can work with others, yet be alone at the same time. I suspect some of these same advantages also translate to participants in online group sessions as well. And for this reason, perhaps many introverts are more comfortable in collaborative projects online than in person. Some of the best ideas I’ve seen emerge from online collaborative exercises come from people who usually remain completely silent in meetings. In many cases, online collaborative projects provide the best of both worlds—you can collaborate and build off the ideas of others, but still take the time to process your thoughts before you add them (and as a special bonus, you don’t have the stress of in-person social interaction). If you consider yourself an introvert, I’d love to hear about your experiences participating in collaborative projects online vs. in person. Do you agree with Susan Cain’s assessment that collaborative group projects are not designed to get the best out of introverts? Do you find yourself making better contributions and contributing more in online projects? Or are online collaborative groups just as bad for you as in-person sessions, and you’d rather just work completely on your own? Call a duck a duck. you are not calling a duck a duck. Read more about how this applies to both brand naming and brand positioning here. It’s a pretty simple rule. But every day you run into a “duck” brand that is trying to pass itself off as a canary or an ostrich or a flamingo when it is actually… say it with me… a duck. Fortunately you find great examples of simple, smart, and descriptive branding in the most unlikely places. 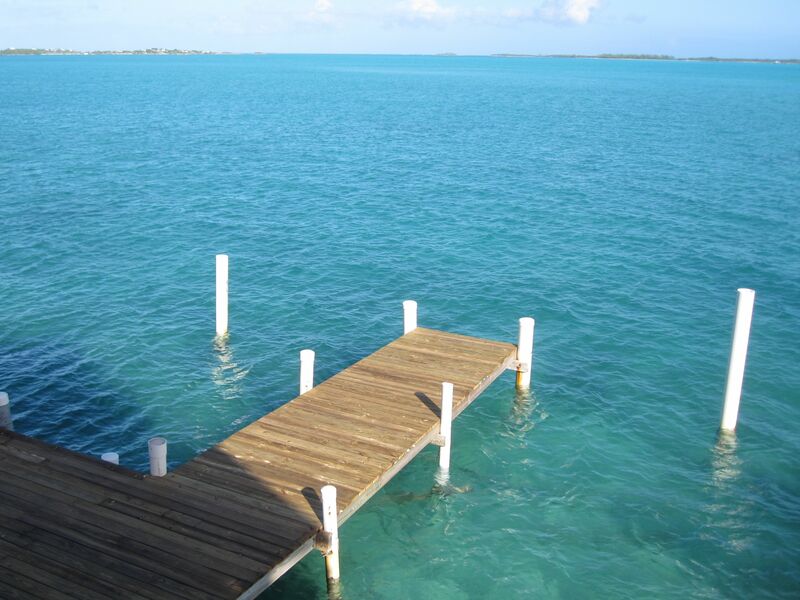 I happened to visit one of those places over the holiday break—a town of less than 1000 people on Great Exuma Island in the Bahamas. George Town is a wonderful and unassuming town with sweet and interesting people. It’s a bit far off the normal tourist grid too—there are only two big resorts within driving distance, and the people who stay at them don’t seem to leave the property much, so George Town is mostly pretty quiet. But what those who don’t visit the town miss is how the locals seem to have mastered the art of branding simplicity. 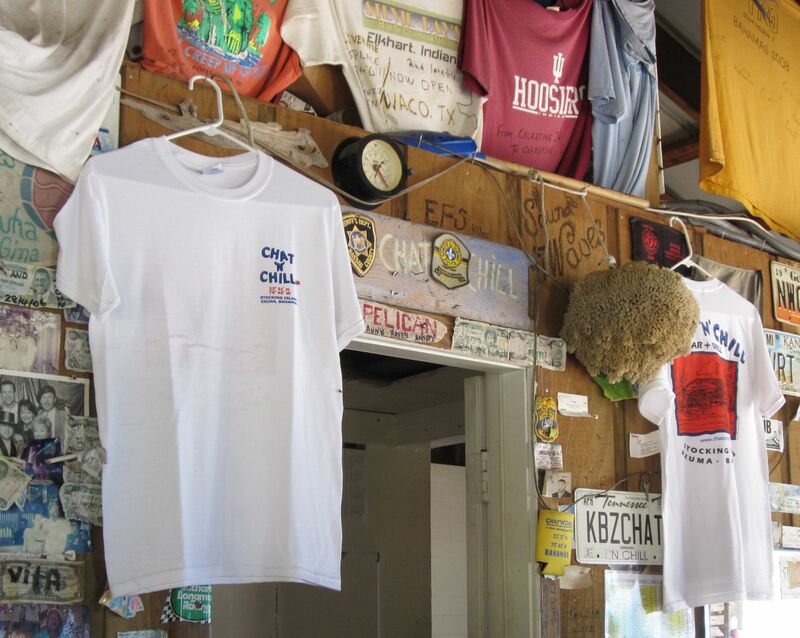 For example, my favorite place we visited on the trip was a little bar across the harbor on Stocking Island serving conch burgers and cold beer, in no particular hurry, to faithful customers who come back year after year from all around the world. Now that is calling a duck a duck. I can tell you from spending the better part of two days there that chatting and chilling describes about 95% of the appeal. In fact, if you have an inability to chill, you probably would hate this spot. If you place a food order, you can expect to wait at least an hour before you get it. This is not fast food. At the risk of brand nerding out a bit too much about what is a really amazing and magical place, I just have to complement the folks who run the Chat ‘N’ Chill. They’ve built an extremely passionate and loyal community by developing a simple brand promise and name, and then delivering on it exactly as you’d dream they would. What more could you ask for? 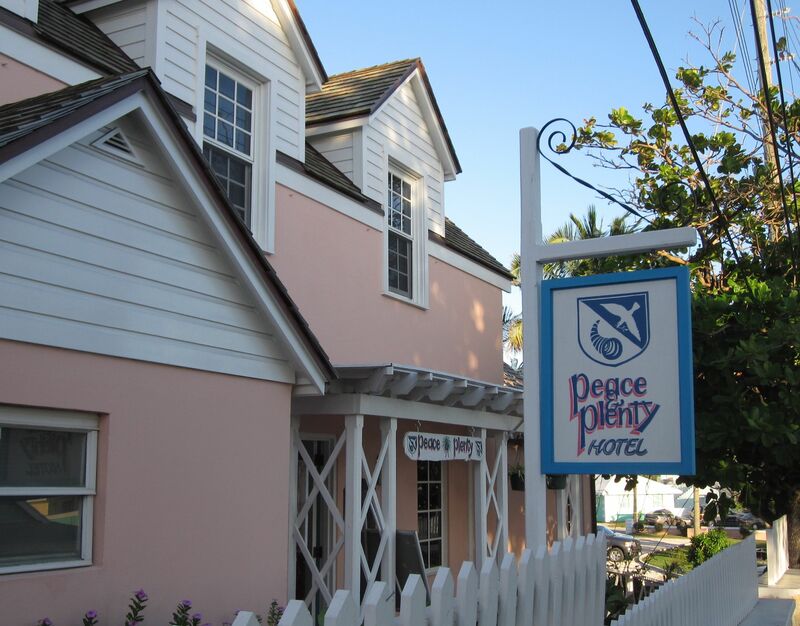 A second example of simple branding done well is the historic old resort we stayed in called the Peace & Plenty (for all their branding genius, the folks in George Town do seem to have an aversion to writing out the word “and”). The picture to the left is the morning view from our room at the Peace & Plenty. It was a pretty nice place to spend some quiet time. The Peace & Plenty has been getting the “peace” part right for more than fifty years, with the help of a staff of long-time employees like Lermon “Doc” Rolle who have kept the experience unique and intimate amidst the clutter of cookie-cutter tropical mega resorts you’ll find elsewhere in the Bahamas. But “plenty” is also an apt descriptor. 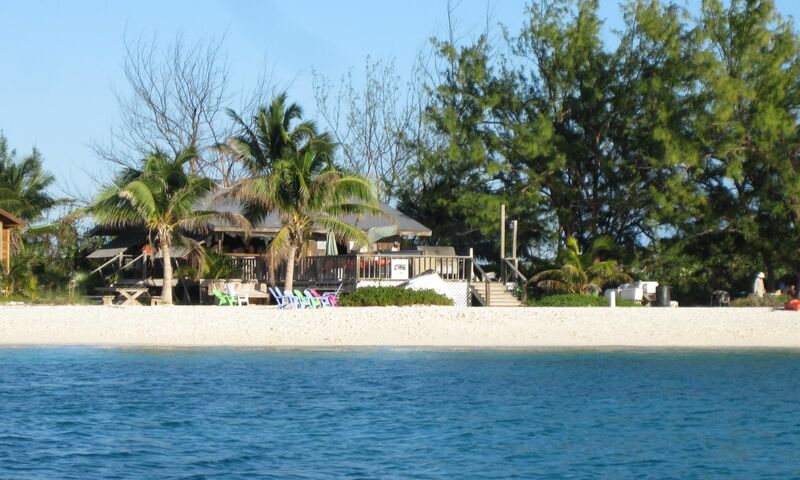 The Peace & Plenty is the only resort located right in the main part of George Town, easy walking distance from pretty much everything you might want to visit, including the ferry to Stocking Island. You can walk around the pond to Eddie’s Edgewater (a restaurant that is across the road from the edge of the water, as you might expect) for some great ribs on Friday night, you can go across the street to Minn’s Watersports to rent a boat for bonefishing, you are a few steps away from the town library, city hall, and a grocery store. It’s a perfect spot: Peace, amidst plenty. In the introduction to The Ad-Free Brand, I point out that some of the best and most clearly positioned brands are built by people with little or no branding experience at all, and I share these examples here as inspiration: anyone, anywhere can build a great brand! I’m sure you have your own examples of simple, elegant branding, naming, or positioning, and if so, feel free to share them in the comments section below. Once you’ve identified the key communities you think it is important to engage with, the next step is to identify the people you’d like to represent your brand within these communities. For simplicity, I like to refer to these folks as brand ambassadors. Start by identifying the people inside your organization who have the best relationships with each community. These people are the best candidates to become your brand ambassadors. The ideal brand ambassador is already an actual community member, actively participating in conversations and projects with other community members. While an employee of your organization, this person shares common values, interests, and experiences with other community members. It is less important what position they hold within your organization and more important how they are viewed by the community itself. After you’ve identified possible brand ambassadors, reach out to them to see if they are willing and interested in expanding their personal roles in the community to include being representatives of your brand as well. Some might already be playing this role, others might be playing this role and not realizing it. Don’t force or pressure people. The ideal candidate will be excited to be considered and will be passionate about the opportunity, so if your best candidate doesn’t seem interested, try to find someone else who is. If you don’t have anyone in your organization who is already a member of the community, you’ll need to have someone join. Choose someone who understands your organization’s story and positioning well but also already shares interests, values, and experiences with the community in question. Have this person attend meetings, join mailing lists, participate on forums, and otherwise begin to contribute to the community first as an individual. It will take a little longer to get started, but it will be worth it if your brand ambassador has a deep contextual understanding of the community before they dive right in officially representing your organization. You should ensure that your brand ambassadors deeply understand your brand positioning so they can live it (not just speak to it) in their activities within these external communities. If you are developing many brand ambassadors at once, consider hosting a brand ambassador bootcamp where new ambassadors can practice telling the brand story and get aligned on the overall positioning of the organization. Also use this as an opportunity to emphasize the key role of these ambassadors in developing the brand experience and keeping relationships with the community healthy and productive. You may have some communities where there is a whole team of ambassadors, not just one. For example, at Red Hat, a large team of developers represented Red Hat (and themselves) in the Fedora community. Invest as many ambassadors as you need in order to provide the best possible support for and adequately communicate with the community. As you recruit brand ambassadors, you extend the internal core of the brand. Although it is wonderful to see your core group getting bigger, extending your reach is also an important time to ensure consistency. Be very careful to take the time to educate all brand ambassadors well so the entire brand orchestra stays in key. Wikipedia defines an ambassador as “the highest ranking diplomat who represents a nation and is usually accredited to a foreign sovereign or government, or to an international organization.” Usually an ambassador lives and operates within the country or organization where he is assigned. Your brand ambassadors should channel the same philosophy. While they are members of your organization, they should “live” within the communities they are assigned to as much as possible while representing your organization within that community. Great brand ambassadors are loyal to the organization and to the community at the same time. They develop relationships of respect, honesty, and trust within the community, which allows them to clearly and openly communicate the priorities, desires, and needs of both sides. Brand ambassadors are not just mouthpieces for the organization, but should also maintain their own personality, interests, and opinions in the community—often distinct from those of the organization. In places where they are representing their own opinions and ideas, they should provide the proper disclaimers. With a little practice, this is not nearly as difficult as it might sound. The key is maintaining an authentic personal voice while being open, transparent, and human in their communications. Don’t think someone in your organization has the right makeup to be a good ambassador based on what you see here, even if he or she has good relationships within the community? Don’t make him or her an ambassador. The brand ambassador is a representative of your brand to the outside world, and the job carries a lot of responsibility and requires a high emotional intelligence and diplomatic sensibility to do well. So take the time to find, train, and support brand ambassadors within your organization. With some attention and focus, you may soon find that your network of ambassadors becomes one of your organization’s most valuable assets. If so, you can find more tips about how to extend your brand effectively in my book, The Ad-Free Brand (not an advertisement, mind you, just a friendly suggestion:). Every organization has people who act or work in ways that are detrimental to the brand. Often, if these people get results (meaning they make financial targets or otherwise achieve the goals that have been set for them), they are praised and rewarded. These off-brand people are a deadly disease. Anyone who is rewarded for working in ways that are harmful to the brand experience will damage your ability to deliver on your brand positioning. In the beginning, your organization has a tree full of healthy employees. And then, an idiot sneaks into the company. That idiot chases away people who don’t like to deal with idiots and uses his or her influence to bring aboard more idiots. If you’re not very wise and very careful, that idiot gets promoted because people tire of fighting with idiots, who also tend to be loud, ambitious, and politically savvy. And then he or she builds a whole team of idiots. Other idiots start popping up elsewhere in the organization. That is how you end up with an organization full of idiots. Letting off-brand people continue to operate unchecked is a quick path to a brand with a multiple personality disorder. It is not only confusing to your brand community, but also can cause lots of internal disagreement and conflict and generally just isn’t they way ad-free brands like to operate. How do you deal with those who don’t live the brand? Some organizations have a no-tolerance rule and seek to quickly eliminate those who do not live the brand. Some instead just focus on the positive, rewarding those who live the brand while passing over those who do not, even if they are getting results. No matter which way you go, do not leave anti-brand behavior unchecked. It could make all of your other efforts a waste of time. What is a brand story and why does it matter? There is no more important tool for rolling out brand positioning than a great brand story. The best brand stories can create gravity around a brand and also help build a strong brand community. They show the concepts behind the brand positioning in action, making it more than words on a page. Does your organization have legends or stories that have been told and retold over the years? How the brand got its name? How the founders of your organization first met? The original problem they were trying to solve by developing your product? Perhaps your particular worldview or internal values became very clear at one moment in the organization’s history. Most organizations have internal legends, stories, and fables that are already being told. Your existing stories and legends are powerful because they are illustrations of who you are and why you do what you do. Often, these stories serve as building blocks for a larger brand story. – Why are we here? – What do we care about? – Why does it matter? In all likelihood, your brand story is already partway being told in the form of these stories and legends that follow the brand around everywhere it goes. Consider collecting as many of these stories as you can as background research and inspiration. An authentic brand story won’t just be made up on the spot. Great brand stories have a lineage and a heritage that are built over time and with the hard work and perseverance of many people. In attempting to articulate the brand story, your job will be part historian, part archeologist, and part sculptor, taking the existing building blocks that have been provided to you by those who built the brand and merging them with the new brand positioning you’ve developed. You’ll need to mold these two views together into an overarching brand story that is both authentic to the brand’s past and relevant to the brand’s future at the same time. It is hard work creating a great story that will get passed on from person to person. You’ll need to recruit the best storytellers you can find to the cause, including your organization’s top writers, designers, and poets (or if you work with an outside firm, bring their best folks in, too). But based on my experience helping develop brand stories for organizations over the past decade, I can tell you that the effort is worth it. A great brand story will not only help you attract new people to your brand community, it will become a powerful guiding force within your organization as well. And here is an example of one of the original Red Hat “legends” that we collected during our time building the brand. Consider taking a look at my new book The Ad-Free Brand (not an advertisement, mind you, just a friendly suggestion:). It has some nice tips for how to build a great brand without the help of… you guessed it… advertising! I admit it. I’m a total Jim Collins fanboy. Ever since my friend Paul Salazar first introduced me to the book Built to Last back in 2002, I’ve been a willing member of the cult of Jim Collins. During my time at Red Hat, we took some of the ideas from Built to Last as inspiration for the process we used to uncover the Red Hat values. 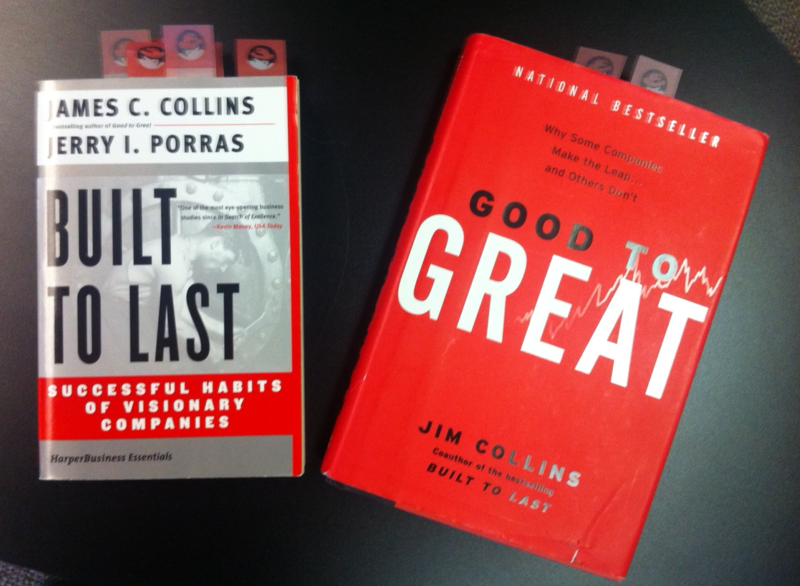 Then we later employed many of the principles from Collins’ next book Good to Great as we further developed the Red Hat positioning, brand, and culture. While many of the Big Concepts (TM) expressed in these books may initially seem a bit cheesy and Overly Branded (TM), I’ve come to love and occasionally use some of the terms like BHAGs (Big Hairy Audacious Goals), the Tyranny of the OR, Level 5 Leadership, and my longtime favorite The Hedgehog Concept. Why? Because they are just so damn useful. They make the incredibly complex mechanics behind successful and not-so-successful organizations and leaders simple and easy for anyone to understand. They are accessible ideas and you don’t have to be a former management consultant with an MBA from Harvard in order to understand how to apply these principles to your own organization. 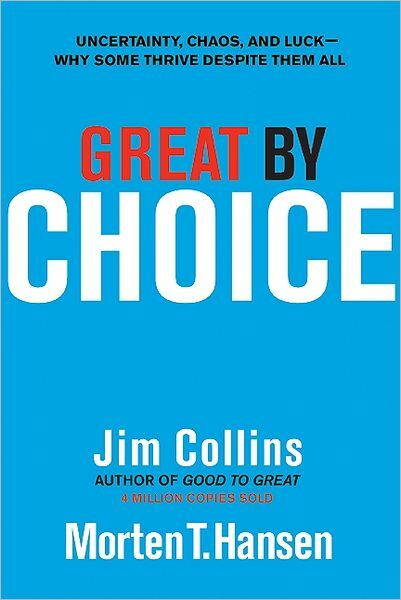 I’d go so far as to say that over the past fifteen years, no one has done more than Jim Collins to democratize the process of creating a great organization. So when I found out that Jim Collins had a new book coming out, his first since the rather dark and depressing (but no less useful) How the Mighty Fall in 2009, and that he’d been working on this new book with his co-author Morten Hansen for the last nine years, I was ready for my next fix. I finished the new book, entitled Great by Choice: Uncertainty, Chaos, and Luck–Why Some Thrive Despite Them All a few nights ago, and here are my thoughts. In this book Collins and Hansen clearly did an immense amount of research to answer this question. In fact, as with Built to Last and Good to Great, the appendixes at the end “showing the math” for how they reached their conclusions take a third or more of the book. Their research led to a set of companies that they refer to as the “10x” cases because, during the study period, these companies outperformed the rest of their industry by 10 times or more. After looking at over 20,000 companies, the final organizations that made the cut were Amgen, Biomet, Intel, Microsoft, Progressive Insurance, Southwest Airlines, and Stryker. Well, as it turns out, the period they were studying wasn’t up until the present day. Because this research began nine years ago, they were studying the companies from 1965 (or their founding date if it was later) until 2002. So in that context, the choice of Microsoft makes a lot more sense. In 2002, Microsoft was still firing on all cylinders (believe me, I remember). –The 20 Mile March: Consistent execution without overreaching in good times or underachieving in bad times. – Firing Bullets, Then Cannonballs: Testing concepts in small ways and then making adjustments rather than placing big, unproven bets (basically akin to the open source principles of release early, release often and failing fast). But then placing big bets when you have figured out exactly where to aim. – Leading above the Death Line: Learning how to effectively manage risk so that the risks your organization take never put it in mortal danger. Many of these concepts come with an awesome allegorical story to illustrate them. That’s the great thing about a Jim Collins book: you can’t always tell whether you are reading a business book or an adventure book. In this case Collins (who is also an avid rock climber himself) shares tales from an ill-fated Everest expedition, the race for the South Pole, and a near death climbing experience in Alaska interspersed with specific stories from the businesses he is profiling. Overall assessment: The book is a fitting companion to Built to Last, Good to Great, and How the Mighty Fall. Simple, accessible, easy to digest, and with some very actionable key concepts that you can immediately put to use. And, unless you read all of the research data at the end, you’ll find it to be a quick read that you can likely finish on a plane trip or in an afternoon. So go on, pick up a copy and let me know if you agree. Consider taking a look at my new book The Ad-Free Brand (not an advertisement, mind you, just a friendly suggestion:). It has some nice tips for how to build a great organization without the help of… you guessed it… advertising! Organizations have a lot more to offer the communities they interact with than the products they sell. When these organizations unselfishly offer assistance to the communities around them, they can build powerful relationships based on trust and shared value rather than just on transactions. Sure, building this foundation will often mean that people in these communities would be more likely to consider buying products or services from you down the road (in case the marketing types ask). But if that is central to your thinking, community members will smell a rat. It is not enough to simply seem selfless while remaining selfishly motivated by your own bottom line. You must actually care what happens to these communities. You must want to help them be more successful at achieving their own goals. Although this approach seems so obvious, my experience of working in the business world for the last 20 years indicates that it’s not. Usually when I begin to talk about helping the communities that surround a brand, people immediately assume I’m just referring to typical organizational philanthropy or corporate citizenship work. While in some cases, a community-based brand strategy will dovetail nicely with these efforts, they have very different end purposes. By carefully considering how you can help the communities of customers, partners, prospects, friends, neighbors, and others that interact with your brand every day, you can not only create value for these communities, you can develop deeper non-transactional relationships that will also benefit your organization in the long run. Consider investing money in projects that help the community achieve its goals. Bonus points if the investment will also help your organization achieve its goals or further your brand positioning. Red Hat and other open source software companies have done this extremely well, investing in projects that later become the heart of products they sell while also creating value for community members at the same time. Many communities are in need of assets that individuals can’t buy on their own. Are there assets you already own or could buy and then give to the community as a gift? Red Hat bought many companies over the years with useful proprietary source code and then gave away the code for free. The community was able to innovate more quickly, and everyone—including Red Hat—reaped the benefits. Your organization might have other assets that would be of value, such as a conference facility that could be used or land you haven’t developed. You could donate your products, services, web server space, or other supplies and materials that might otherwise go to waste. Your organization probably has knowledgeable people who might have a lot to offer. Consider allowing employees to spend on-the clock time helping on projects that further community goals and support the brand positioning. Who do you and others in your organization know, and how might these relationships be of value to others in the brand community? Perhaps you can make connections that not only help the brand community, but also help your organization at the same time. Could you use the power of your brand to shine the light on important community efforts, drawing more attention and help to the cause? When organizations begin thinking like members of communities—when they are of the community, not above the community—and bring value in the same ways individuals do, they can fundamentally alter the relationships they have with members of the community. This means that organizations have to stop thinking selfishly about what they want to get the communities to buy from or do for them (what I call Tom Sawyer thinking) and start thinking about what assets they bring to the table that could create real value for community members. Faking it will get you nowhere, but when you really bring some tangible value to a community and the community becomes better for it, your brand will reap the benefits down the road. This is the ninth in a series of posts drawn from The Ad-Free Brand. Where should you focus brand efforts? Community or customer? It has become a truism in marketing that you should stay focused on your customers. In most of our organizations, we are attempting to sell something to make a profit. We need customers. But I often use the word community in places where most people would use the word customer. Why? Am I just being naive about what pays the bills for our organizations to continue to thrive? Am I committing heresy by not staying focused on just customers? I believe that the dogged focus on marketing to customers alone has created a myopic view that makes us ignore many of the important people who interact with our brands. Customers are important; most organizations couldn’t exist without them. So what is the issue? Customers are not just listening to us anymore. When organizations focus on only interacting with customers rather than taking a holistic view of the entire brand community, they forget that in the twenty-first century, the version of the brand represented by the organization might only be a small percentage of the brand the customer sees. Where is the rest of the story coming from? Everyone else who interacts with the brand: the brand community. When rolling out brand positioning, ad-free brands understand that it matters what everyone thinks about the brand—not just the customers. By understanding and planning your interactions with all of the communities around your brand, you have a chance to impact the customers’ views of who you are in a much deeper way than if you were just speaking to customers directly through marketing and advertising. And that’s just if you are only concerned with the success of your business itself. If you are a nonprofit or a member of the growing breed of socially responsible businesses interested in benefitting the communities they serve while remaining for-profit, you’ll see even greater benefits from this approach. So should you be focused on customers? Absolutely. But just remember that you aren’t the only folks talking to your customers about your brand. When you build a brand strategy that ensures the positioning resonates with all the people around your brand and not just customers, you’ll be on the path to much deeper, more fulfilling relationships with the communities surrounding your brand–and you’ll probably be heard by potential customers who would have never given you the time of day otherwise. This is the eighth in a series of posts drawn from The Ad-Free Brand. In an earlier post, I highlighted one of the key concepts behind the ad-free brand approach: building your brand from the inside out, starting with the folks who are likely to know and care most about the brand—the employees. When building the brand from the inside out, the goal is to embed the core positioning deeply within the mind and actions of each employee of the organization so that it comes out consciously and even unconsciously in their interactions with the external brand community. You can’t force people into “living the brand.” No one likes to be told what to do. I certainly don’t. Ad-free brands work from the core principle that those who are not invited on the journey will usually reject the destination. So, broad participation in the brand-building process is often a prerequisite for the brand positioning to really take off. Unfortunately, the larger the organization, the harder it is to achieve consistency in the way the brand positioning is rolled out. I like approaching the internal rollout of brand positioning by channeling the mindset of the conductor of an orchestra. An orchestra conductor is able to create amazing, complex, and beautiful music just by using a tiny baton. The conductor’s role is to organize, motivate, and inspire a group of people to make music together. The conductor chooses the piece of music, interprets the piece, gives every person in the orchestra a part to play, and helps each musician rise to the level of his or her talent or experience. An orchestra in which every musician plays the same notes would be boring, to say the least. In an orchestra, the diversity of instruments—woodwinds, percussion, strings, and brass—allows for the complex and beautiful expression of music. Yet many organizations attempt to roll out their brand positioning by expecting everyone to toe an explicit company line, sticking to a rehearsed speech. This kind of approach does not play well for ad-free brands. To me, the rehearsed expression of the brand positioning comes off as canned, corporate BS that most people will ignore. To be effective, ad-free brands take advantage of the talent and voice of each employee, allowing each person to utilize his or her own strengths, interests, and passions to explain or begin to live the brand positioning. The goal is not getting everyone to play the same notes—it’s getting everyone to play in the same key. Different people prefer the sounds of different instruments and types of music. One of the benefits of having many people playing in your orchestra is that you are likely to create music that appeals to all types of people, which will in turn attract even more people. When you create a situation where many people are communicating and living the positioning in their own ways, you increase the chance that other people will begin to hear, understand, value, and live it themselves. And that’s when the brand has a chance to really shine. This is the seventh in a series of posts drawn from The Ad-Free Brand.